UNITED NATIONS, Jun 20 2014 (IPS) - With legislation, legality and policy at the forefront of governmental decisions on nuclear weapons, what seemingly gets neglected are our morals. The controversial nature of the topic, combined with states’ inability to reach binding agreements on non-proliferation and disarmament, has prompted religious leaders to step in to fill the gap in civil society by educating their followers about the issue. 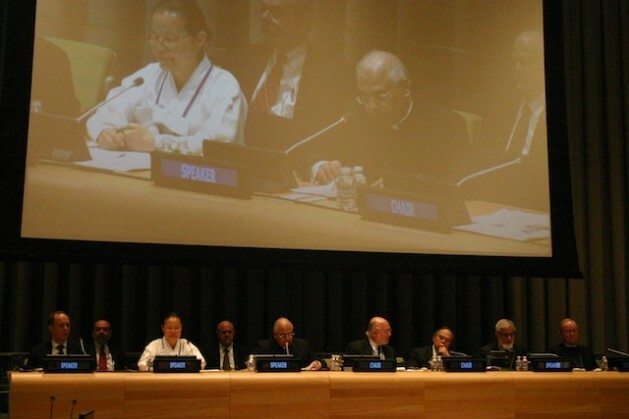 At a recent panel discussion at the United Nations headquarters in New York City, interfaith leaders sat down with members of the Global Security Institute (GSI) and the Philippines mission to the U.N. to discuss the moral compass that could guide progress on disarmament and deterrents. In a jovial yet poignant statement, Libran Cabactulan, the Permanent Representative of the Philippines to the U.N., called the gathering a “last ditch” attempt to advance the issue, which appears to have reached a global stalemate. Cabactulan told IPS that governments have a tendency to use multilateral forums as platforms for discussing practicalities, principles and politics, rather than questions of right and wrong. This is why, he said, religious and interfaith leaders have an important role to play. “If we don’t prevail on this issue we have no future (because) by accident, design or madness the weapons are going to be used,” GSI President Jonathan Granoff told IPS. There are some 17,265 nuclear weapons in the world today, according to the Stockholm International Peace Research Institute (SIPRI). If these weapons were to be used each explosion would be around eight to 100 times larger than the bombs used on Hiroshima and Nagasaki. At least 2,000 of the roughly 4,400 deployed warheads are in a state of high operational alert. The U.S. is responsible for 2,150 of the world’s deployed weapons, while Russia follows close behind with 1,800. France and the UK have 290 and 160 deployed weapons respectively. Data for China, India, Pakistan, Israel and North Korea are harder to find, according to SIPRI. According to the Bulletin of the Atomic Scientists, both Russia and the United States have recorded massive declines in their respective stockpiles over the years. As of 2012, Russia had 4,650 active warheads compared to 45,000 in 1986, while the U.S. had trimmed its stocks from 31,000 in 1967 to 2,250 in 2012. Still, the two superpowers remained far ahead of their counterparts in the P5 (the five permanent members of the U.N. Security Council) including France, which has 300 active warheads, China (240) and Britain, which possess 225. GSI approached the Philippines mission as a partner largely due to Cabactulan’s leadership in the field as the 2010 Non-Proliferation Review Conference President. They collaborated with seven faith leaders along with the U.N High Representative for Disarmament Affairs (UNODA), Angela Kane. “We (UNODA) don’t [necessarily] target religious groups, but we have very strong partners in civil society and we really rely on them to be a multiplying factor,” Kane told IPS. However, Kane noted that progress on the issue with the help of interfaith leaders was very limited. “Progress is not dependent on you or I or religious leaders [but] on the member states making progress in these areas,” she said. Granoff also said that although there had been many statements made by religious leaders about non-proliferation and disarmament their words have failed to gain much traction. “Religious voices can help set the moral compass for the community but they have thus far not exercised their moral persuasion in a sufficiently influential fashion,” he said. With 85 percent of the world’s people identifying with some form of organised religion, the potential for faith-based organisations to change public opinion is huge. “The United Religious Initiative and the Religions for Peace have a large footprint and engagement with many religious leaders and are seriously committed to the issue and I look forward to working with them,” he asserted. With the next non-proliferation treaty (NPT) review conference to be held next year the ambassador expressed serious concern over the lack of movement from member states. “Nobody seems to be interested, nothing is happening. In the latest PrepCom [the third Preparatory Committee meeting this year] they were not able to agree on practically anything,” he said. The treaty currently represents the only legal commitment made by nuclear weapon states to work towards disarmament, but progress has been painfully slow. Kane also noted that funding for the process of disarmament is low. Within the U.N. system, UNODA is one of the smallest departments and was only allocated 0.45 percent of the world body’s 2014-2015 budget, despite the department’s crucial role in determining the future of humanity. In contrast, member states shell out huge sums of money to maintain their nuclear arsenals. According to the International Campaign to Abolish Nuclear Weapons (ICAN), nuclear states spend nearly 300 million dollars a day on their nuclear forces. The global advocacy coalition estimates that annual expenditure on nuclear weapons is close to 105 billion dollars, which works out to roughly 12 million dollars an hour. Experts say the time is ripe for members of civil society, particularly faith leaders, to help turn the tide. “I long to see a day when every pope, every sermon, [and every] synagogue around the world is trumpeting that these weapons of mass destruction are an instrument of the devil and an instrument of sin,” Cabactulan said. “The clock is ticking and we do not know what is going to happen and maybe by a flick of a finger or a click of a mouse we [will] all [be] gone,” Cabactulan said.